Floor marking products that glow-in-the-dark for emergency evacuation and egress path marking. Photoluminescent attribute provides high visibility markers that glow for days without electrical power. Photo-luminescent floor marking products offer your workers more understandable pathways when evacuating in an emergency. With brightly glowing tapes, dots and discs, help evacuees move more quickly, and more safely. Photoluminescent strips that meet all the requirements for the NY MEA standards to listed as approved products for emergency exit and egress markings. No electricity needed. Strips glow-in-the-dark with a visibility of 80 feet. Special accessories to help make photoluminescent safety signage more resilient, easier to apply and to check light levels before installing. 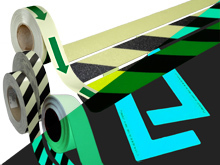 Photoluminescent floor marking tapes and strips provide important guidance when people are panicked and under stress because of an emergency egress situation. Even if all the lights go out, photoluminescent markings provide a brightly glowing path showing the direction to move in. Photoluminescent products charge up in about 1 hour using ambient light sources like sunlight, fluorescent or incandescent light. Special photosensitive particles in the print surface react to light and take on a charge that emits light when other lights go out. The photoluminescent effect lasts at full power for about 90 minutes before beginning to gradually dim over the next several days. Once ambient light is restored, the photoluminescent particles recharge and are ready for the next emergency. With a life cycle of more than 25 years, photoluminescent products save you the effort of providing electrical power, replacing batteries or even having to replace surfaces for over a full generation. In fact, it's more likely the backing surface will wear out before the photoluminescence no longer reacts to light.